Question How to know what case should i buy? I have a acer veriton x4610g and im trying to upgrade case so i can have better graphic card. What case do you recommend that can fit gtx 1050ti(or can this one support it) and what power supply should i buy then? The connections are proprietary , can't be moved to a new case. Just drop a SFF GT 1030 into the system, the 220W should be enough and it's a massive improvement over your current iGPU. The 10XX series requires a active adapter to work with VGA adapters. So i just buy a cable that is hdmi for graphic card and dvi for monitor and that is all i need? Needs to be active, per that site it doesn't say that so I don't think it would work. So only adapter has to be active?cabel can be one that i already have? Can you drop a link for active adapter? Or can i buy the graphic card that already have vga port so i dont need adapter? It must be active or it won't work. This one says it's active and is on the same site. Unfortunately active adapters are a bit more pricey. I can see,but if a graphic card has direct vga port do i need this or i can just use my cable from previous graphic card? If it has a VGA port then you don't need the active cable. If a 10XX series Nvidia GPU has a VGA port then it's a fake. Wow that is surprising. (I even checked Zotacs website). 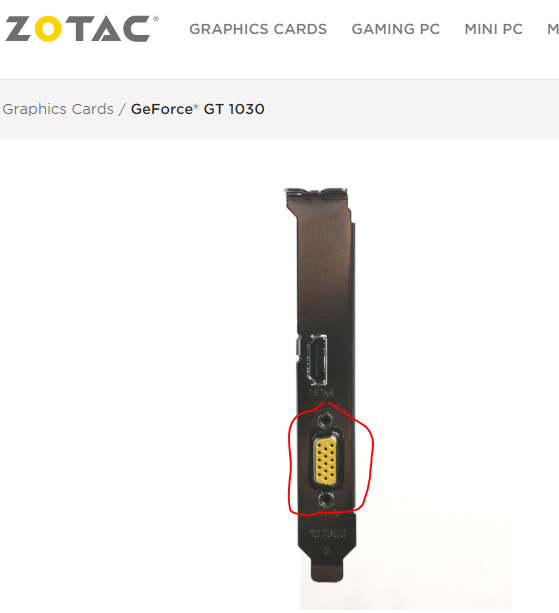 Zotac must of figured out a way to use VGA on a GPU that didn't originally support it. So it is good and i can buy it right? Of course, it should suit your needs well. Let me know how it turned out (still a little shocked by the native VGA connection LOL).